New Mexico is a state located in the southwestern and western regions of the United States, admitted to the union in 1912. It is usually considered one of the Mountain States. New Mexico is the 5th most extensive, the 36th most populous, and the 6th least densely populated of the 50 United States. Inhabited by indigenous peoples of the Americas for many centuries before European exploration, New Mexico was subsequently part of the Imperial Spanish viceroyalty of New Spain. Later, it was part of the newly formed nation of Mexico for a short period before becoming a U.S. territory and eventually a U.S. state. Among U.S. states, New Mexico has the highest percentage of Hispanics, including descendants of Spanish colonists who have lived in the area for over 400 years. It also has the second-highest percentage of Native Americans after Alaska, and the fourth-highest total number of Native Americans after California, Oklahoma, and Arizona. The tribes in the state consist of mostly Navajo, Puebloan and the Apache peoples. As a result, the demographics and culture of the state are unique for their strong Hispanic and Native-American influences, both of which are reflected in the state flag. The scarlet and gold colors of the New Mexico flag are taken from the royal standards of Spain, along with the ancient sun symbol of the Zia, a Pueblo-related tribe. New Mexico, or in Spanish, is often incorrectly believed to have taken its name from the nation of Mexico. However, New Mexico was given its name in 1563, and again in 1581, by Spanish explorers who believed the area contained wealthy Indian cultures similar to those of the Mexica (Aztec) Empire. Mexico, formerly known as New Spain, adopted its name centuries later in 1821, after winning independence from Spanish rule. Consequently, New Mexico was only a part of the independent federal republic of Mexico for 12 years, 1836 through 1848. The two developed as neighboring Spanish speaking communities, with relatively independent histories. The states total area is 121,412 square miles (314,460 km2). The eastern border of New Mexico lies along 103° W longitude with the state of Oklahoma, and three miles (5 km) west of 103° W longitude with Texas. On the southern border, Texas makes up the eastern two-thirds, while the Mexican states of Chihuahua and Sonora make up the western third, with Chihuahua making up about 90% of that. The western border with Arizona runs along the 109° 03 W longitude. The southwestern corner of the state is known as the Bootheel. The 37° N latitude parallel forms the northern boundary with Colorado. The states New Mexico, Colorado, Arizona, and Utah come together at the Four Corners in the northwestern corner of New Mexico. New Mexico, although a large state, has little water. Its surface water area is about 250 square miles (650 km2). The New Mexican landscape ranges from wide, rose-colored deserts to broken mesas to high, snow-capped peaks. Despite New Mexicos arid image, heavily forested mountain wildernesses cover a significant portion of the state, especially towards the north. 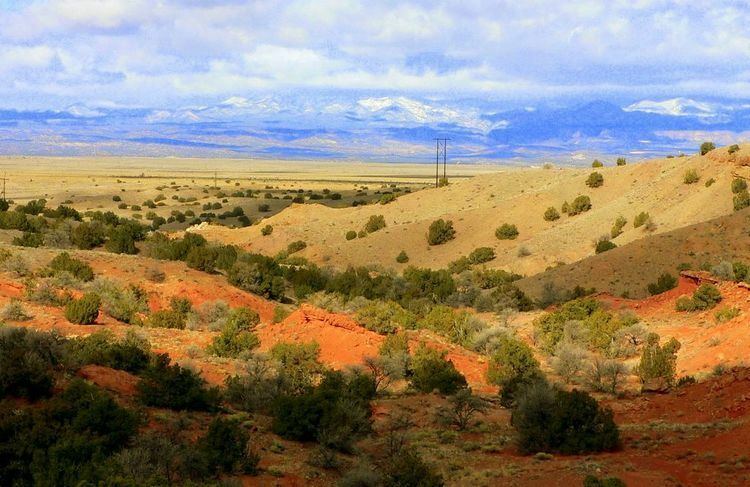 The Sangre de Cristo Mountains, the southernmost part of the Rocky Mountains, run roughly north-south along the east side of the Rio Grande in the rugged, pastoral north. The most important of New Mexicos rivers are the Rio Grande, Pecos, Canadian, San Juan, and Gila. The Rio Grande is tied for the fourth longest river in the U.S. The first known inhabitants of New Mexico were members of the Clovis culture of Paleo-Indians. Later inhabitants include American Indians of the Mogollon and Ancestral Pueblo peoples cultures. By the time of European contact in the 16th century, the region was settled by the villages of the Pueblo peoples and groups of Navajo, Apache and Ute. Francisco Vásquez de Coronado assembled an enormous expedition at Compostela in 1540–1542 to explore and find the mystical Seven Golden Cities of Cibola as described by Fray Marcos de Niza. The name Nuevo México was first used by a seeker of gold mines named Francisco de Ibarra who explored far to the north of Mexico in 1563 and reported his findings as being in "a New Mexico". Juan de Oñate officially established the name when he was appointed the first governor of the new Province of New Mexico in 1598. The same year he founded the San Juan de los Caballeros colony, the first permanent European settlement in the future state of New Mexico, on the Rio Grande near Ohkay Owingeh Pueblo. Oñate extended El Camino Real de Tierra Adentro, "Royal Road of the Interior," by 700 miles (1,100 km) from Santa Bárbara, Chihuahua to his remote colony. The settlement of Santa Fe was established at the foot of the Sangre de Cristo Mountains, the southernmost subrange of the Rocky Mountains, around 1608. The city, along with most of the settled areas of the state, was abandoned by the Spanish for 12 years (1680–1692) as a result of the successful Pueblo Revolt. After the death of the Pueblo leader Popé, Diego de Vargas restored the area to Spanish rule. While developing Santa Fe as a trade center, the returning settlers founded Albuquerque in 1706 from existing surrounding communities, naming it for the viceroy of New Spain, Francisco Fernández de la Cueva, 10th Duke of Alburquerque. As a part of New Spain, the claims for the province of New Mexico passed to independent Mexico in 1821 following the Mexican War of Independence. The Republic of Texas claimed the portion east of the Rio Grande when it seceded from Mexico in 1836, when it incorrectly assumed the older Hispanic settlements of the upper Rio Grande were the same as the newly established Mexican settlements of Texas. Texas only attempt to establish a presence or control in the claimed territory was the failed Texan Santa Fe Expedition, when their entire army was captured and jailed by Hispanic New Mexico militia. Following the Mexican-American War, from 1846–1848 and the Treaty of Guadalupe Hidalgo in 1848, Mexico ceded its mostly unsettled northern holdings, today known as the American Southwest and California, to the United States of America. In the Compromise of 1850 Texas ceded its claims to the area lying east of the Rio Grande in exchange for ten million dollars and the US government established the New Mexico Territory on September 9, 1850, including most of the present-day states of Arizona and New Mexico, and part of Colorado. The United States acquired the southwestern boot heel of the state and southern Arizona below the Gila river in the mostly desert Gadsden Purchase of 1853, which was related to the construction by the US of a transcontinental railroad. The compromise of 1850 created the current boundary between New Mexico and Texas. It is also considered during this time a surveyors error awarded the Permian Basin to the State of Texas, which included the city of El Paso. Claims to the Permian were initially dropped by New Mexico in a bid to gain statehood in 1911. Congress admitted New Mexico as the 47th state in the Union on January 6, 1912. A major oil discovery in 1928 brought prosperity to the state, especially Lea County and the town of Hobbs, named for James Hobbs, who was a homesteader there in 1907. The Midwest State No. 1 well, begun in late 1927 with a standard cable-tool drilling rig, revealed the first signs of oil from the Hobbs field on June 13, 1928. Drilled to 4,330 feet and completed a few months later, the well produced 700 barrels of oil per day on state land. The Midwest Refining Companys Hobbs well produced oil until 2002. The New Mexico Bureau of Mines and Mineral Resources called it "the most important single discovery of oil in New Mexicos history". During World War II, the first atomic bombs were designed and manufactured at Los Alamos and the first was tested at Trinity site in the desert on the White Sands Proving Grounds between Socorro and Alamogordo. New Mexico has benefited from federal government spending. It is home to three Air Force bases, White Sands Missile Range, and the federal research laboratories Los Alamos National Laboratory and Sandia National Laboratories. The states population grew rapidly after World War II, going from 531,818 in 1940 to 1,819,046 in 2000. Employment growth areas in New Mexico include microelectronics, call centers, and Indian casinos. New Mexican cuisine is the regional cuisine of the US state of New Mexico. 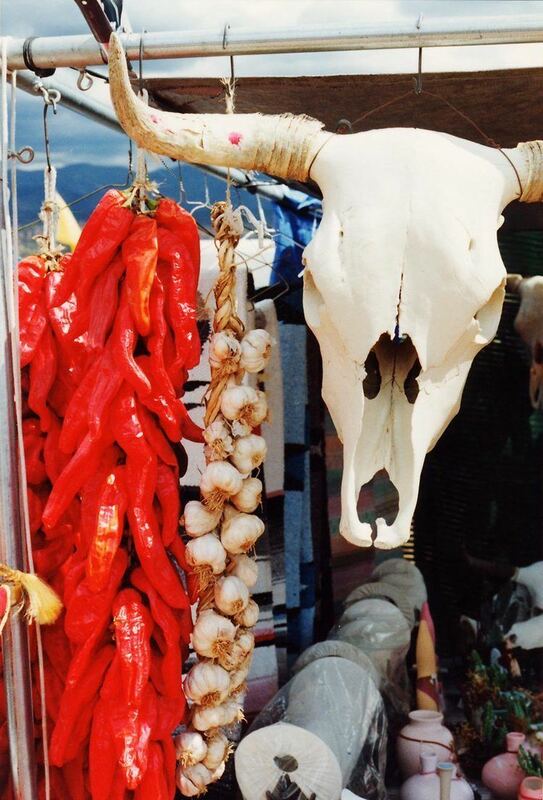 Part of the broader Southwestern cuisine, New Mexico food culture is a fusion of Spanish and Mediterranean, Mexican, Pueblo Native American, and Cowboy Chuckwagon influences. "New Mexican food is not the same as Mexican and Tex-Mex" foods preferred in Texas and Arizona. New Mexico is the only state with an official question—"Red or green? "—referring to the choice of red or green chile. Combining both red and green chile is often referred to as "Christmas". Chile, beans, and corn have been described as the "basic ingredients of New Mexico cooking," and all can be locally grown. One of its defining characteristics of New Mexican Cuisine is the dominance of the New Mexican chile, which are either red or green depending on their stage of ripeness when picked. Other distinctive elements include blue corn, the stacked enchilada, and sopapillas into which honey is added moments before eating. Tex-Mex additions such as sour cream (lack of refrigeration) and Cal-Mex additions such as guacamole (avocado does not grow in the desert climate of New Mexico) are also noticeably absent in traditional New Mexican cuisine.